We welcome you to visit the Lord at any time. 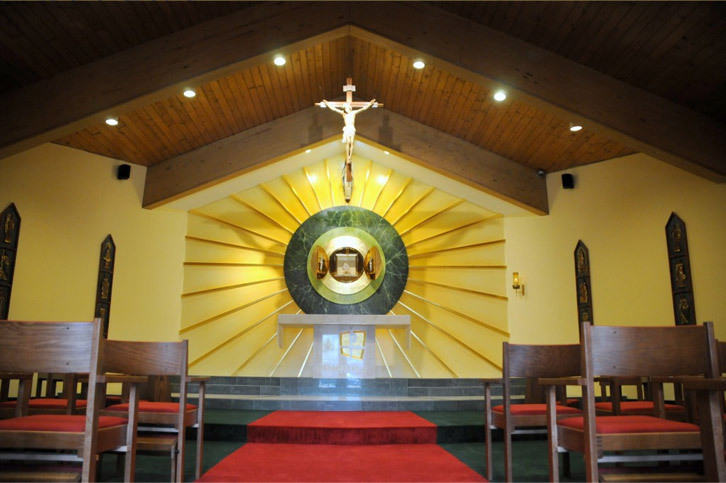 Our beautiful Perpetual Adoration Chapel is open to everyone. An access code is required for entrance from 8:00 pm until 6:00 am. The access code can be obtained from the Parish Office during regular business hours. 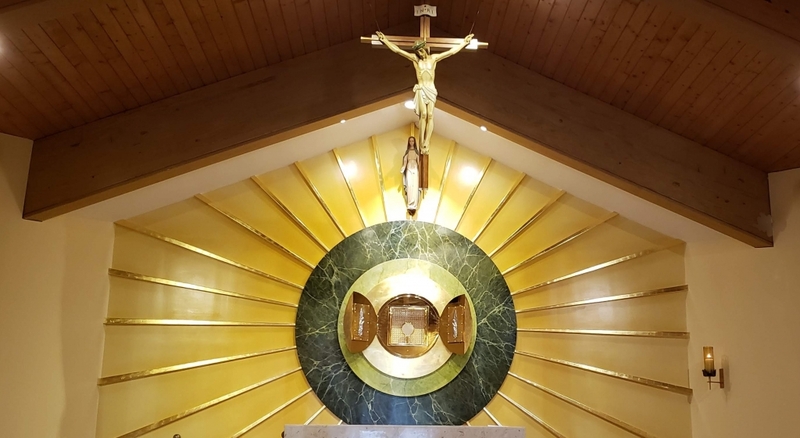 Near the epicenter of the campus of the St. Vincent Ferrer church and school, there is a stunning yet peaceful place of refuge known as the Perpetual Adoration Chapel of the Immaculate Conception. Many visitors from near and far seem awestruck by the simple, yet elegant beauty of this placid setting, and love to spend time here in silent prayer and adoration of the Holy Eucharist. When you walk into its lobby, and then into the chapel proper, you are greeted by hushed, yet glorious tones of gentle choral chant that accents this stunning “jewel box” house of prayer. The generous gift of an anonymous donor, the chapel affords an opportunity of quiet prayer in solitude or a small group recitation of prayers for peace. The green carpet setting of the main body of the chapel gives the appearance of a pastoral setting, which is then divided by a royal red runner in the center. This helps focus one’s attention on the centerpiece of this regal, yet simple setting: the bronze tabernacle that holds the Eucharistic Presence, viewed through transparent, yet securely locked inner doors. Adorning the walls on either side of the sanctuary is a series of four heavy, hand-carved oaken icons with three distinct images depicting the Virgin Mary, as well as angels and some saints. These wooden icons were brought to the chapel from a Mexican cantina, where they were rescued from what was an out-of-place and irreverently used setting. They now draw together the rest of the spiritual treasures that grace this oratory, viz., the crucifix suspended over the marble altar, several spherical shapes surrounding the tabernacle that represent the celestial bodies of the universe, and the high-placed statue of Our Lady Queen of the Universe on the uppermost rear wall. The spacious chapel, which comfortably and individually seats forty-four persons in separate armchairs, was opened in 2008 and replaces the tiny, windowless one in use for the previous ten years. The entry houses a true-to-size copy of the painting of Our Lady of Perpetual Help, as well as a hand-woven tapestry that was brought from Guatemala, and appropriately depicts the Blessed Sacrament. On either side of the lobby, just beyond the wood framed and glass doors, are two Reconciliation Rooms that replace the former narrow confessionals. 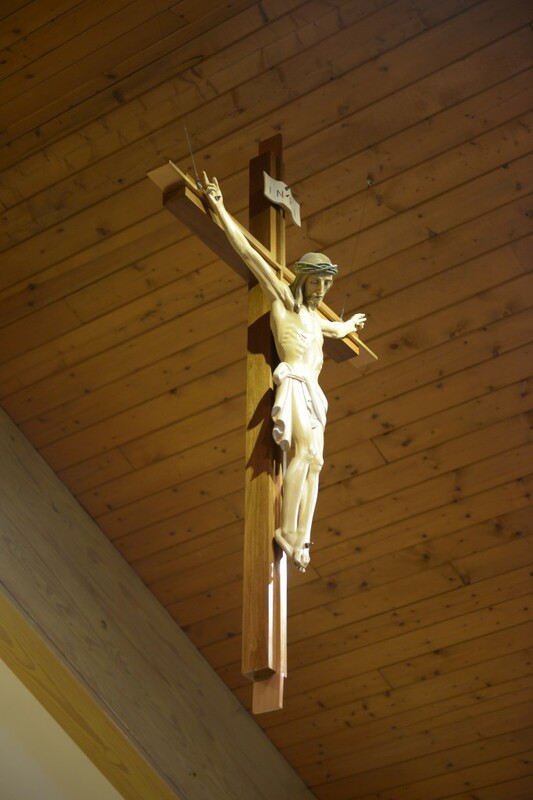 Along the side corridors, you will find the Way of the Cross – formerly located on two back walls of the church, several different pictures depicting Our Lord’s Passion, and some familiar images of the Virgin Mary. 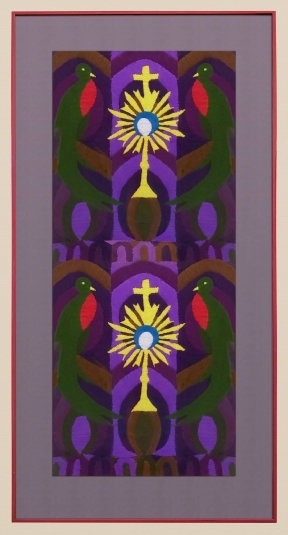 Several of these religious items, including the Eucharistic tapestry, were donated by Msgr. Tom. He also worked out the design of the chapel. His vision was to allow more people to spend time in peaceful prayer in an oasis that will help lift up one’s soul and fortify the spirit for the rigors of the day. We are truly blessed to have such a place available day and night, and invite you to come and spend a little time with Our Lord. He’s actually working miracles here! Pray, too, for the anonymous donor who made all this possible. It is by God’s grace that we have been blessed in this parish with a monument to sustain our faith.